Join Lloyd and the Troma Team June 19th-22nd at the annual Wizard World / Comic-Con! AMC’s “Comic Book Men” & Troma Team-Up at Wizard World this weekend! After an amazing birthday party celebrating the Toxic Avenger‘s 30th Anniversary at Bizarre AC this past weekend, legendary director Lloyd Kaufman and Toxie armed with a fierce team of Tromettes return to Philadelphia, Pennsylvania to Tromatize the 2014 Wizard World Philadelphia Comic Con. The Troma Team will be making their official Wizard World headquarters at Booth #826 for the entire duration of the Con and have a juggernaut of exciting events lined up. On Friday June 20th, 2014 AMC’s “Comic Book Men” and Troma President Lloyd Kaufman team-up for a crowd-interactive Discussion and Q & A at 6:30pm in Room 113. While this is “Comic Book Men” Ming Chen, Bryan Johnson and Michael Zapcic’s inaugural visit to the Wizard World Philadelphia Comic Con, this is not the first time these two super forces have shared a stage. One thing is for sure when Bryan Johnson and Lloyd Kaufman have microphones anything can, and probably will, be said. You do not want to miss this unique experience! Later that evening, head over to the Playground at the Adrienne Theater for the special One Year Anniversary taping of “Hang On with Aaron Nevins” – the only comedy talk show where the audience is part of the conversation. Lloyd, Toxie, and the Tromettes will join host comedian Aaron Nevins, and writer and performer on NBC’s Late Night with Seth Meyers, Ben Warheit for an intimate and hysterical sit down. The show begins at 8pm, tickets are just $5.00. Get yours now because this event will sell out. Tickets for “Hang On with Aaron Nevins” with special guests Lloyd Kaufman & Ben Warheit can be purchased here. James Gunn (Director of Marvel’s highly anticipated Guardians of The Galaxy) began his career with Troma Entertainment, where he wrote his debut feature, Tromeo & Juliet. 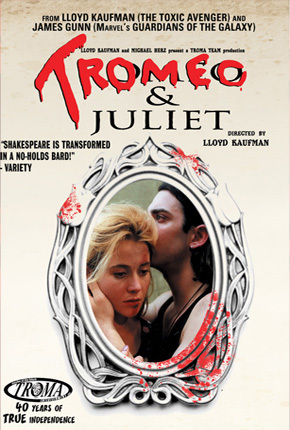 On Saturday June 21st Awesome Fest presents an exclusive screening of Tromeo & Juliet with a live interactive color commentary from director Lloyd Kaufman discussing the making of the film, working with Gunn, and tales from 40 Years of Truly Independent Filmmaking. The screening begins at 1:15pm in Room 108. On Friday and Saturday Lloyd Kaufman will present for the first time ever the Official Trailer of his new upcoming film Return to Nuke ‘Em High: Vol. 2 to a live audience during the “Comic Book Men” Team-up and before the Tromeo & Juliet screening exclusively for Troma’s Wizard World Philadelphia Comic Con fans! “Parting is such sweet sorrow” – So make sure to spend the weekend close to the Troma Booth (#826) as it will be open the entire duration of Comic Con for you to pick up all of your favorite movies, books, t-shirts, posters, and vintage Troma comics. Lloyd Kaufman, Toxie, and the Tromettes will be available for FREE Photo Opportunities and Signatures on any and all Tromabilia! Come be a part of all of the Tro-matic Interactivity this week at Wizard World Philadelphia in celebration of Troma’s 40th Anniversary! This entry was posted on Wednesday, June 19th, 2013 at 2:46 pm	and is filed under Events. You can follow any responses to this entry through the RSS 2.0 feed. You can leave a response, or trackback from your own site.